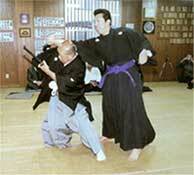 The Teiydo School follows the fundamental teachings of the Hakkoryu Hombu. Students begin their training toward their Shodan-gi understanding, as well as learning the Koho Shiatsu principles. Time and patience is the guideline for advancement and promotion. There is no quick schedule for advancing or promoting. Each student carefully develops their own path and works closely with the instructor to learn and develop their experience and knowledge. Learning is not just in the dojo; all students are encouraged to add to their knowledge and integrate with their personal resources to enhance their development. As students progress in their learning and training, a greater depth of understanding is conferred individually as each student advances. The communion of Hakkoryu and the world is important to our teaching and advancement. Hakkoryu students are modeled in being contributing citizens, and role models for their family. Integrity, dignity, respect and humility, as well as perseverance are developed traits Hakkoryu students learn and promote. The Hakkoryu community is quite vast worldwide. In the last several years, the Hakkoryu organization has undergone changes and affirmations to maintain the traditional and future of the organization. An interactive communication with representatives of the Hombu has been installed to improve our tradition and our objectives. The Hombu is aware there are some unauthorized Instructors promoting Hakkoryu and displaying their practices as being sanctioned by the Hombu. Unfortunately, people become unsuspected victims of such operations. If anyone is aware of any organization or school who is displaying the teachings of Hakkoryu, we encourage people to contact the Hombu via, Hakkoryu.com for confirmation. You must tune three strings when you practice the shamisen. Most beginners cannot, so for their beginning stage, they ask their teacher to tune it for them instead of doing it themselves. But gradually, bit by bit, because they practice everyday, their feeling for the sound becomes sharper and sharper. Usually within a year or so, they have a trained ear for the sound and can tune it by themselves. So until then, teachers won’t say anything very useful to their students. Teachers know there are no words to express how to feel the sound. Progress cannot be rushed. It depends on the abilities and determination of the Deshi. Step by step, the techniques of Hakkoryu become more advanced, powerful, and in combination, sometimes complicated. It is Hakkoryu’s purpose to eventually elevate a Deshi’s skill to the point where he/she will be able to create their own techniques (Henka) for use in practical self-defense situations. This is when the Deshi stops imitating and takes on Hakkoryu techniques as though their own. As with all bugei/budo entities, the teaching approach used in any particular dojo is strongly influenced by the senior Shihan’s personal views, strengths, abilities, experiences, training, age, body type, and outlook on combat. In general, and depending on the situation, the initial attitude taken in Hakkoryu before and during a serious encounter is typically “Shobu” (a serious, but perhaps not deadly encounter) or “Shinken Shobu” (a combat situation which could result in death). 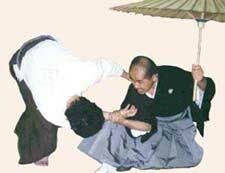 In Hakkoryu, some Shihan take the position that offense and defense are to be considered one and the same. Many others view Hakkoryu as entirely defensive in nature. Both outlooks can be defended and are allowed in Hakkoryu. Shodai Soke’s personal approach was to assure decisive victory while causing as little injury to the attacker as possible.